Home / Lefse / Largest Lefse Crowd Ever!? 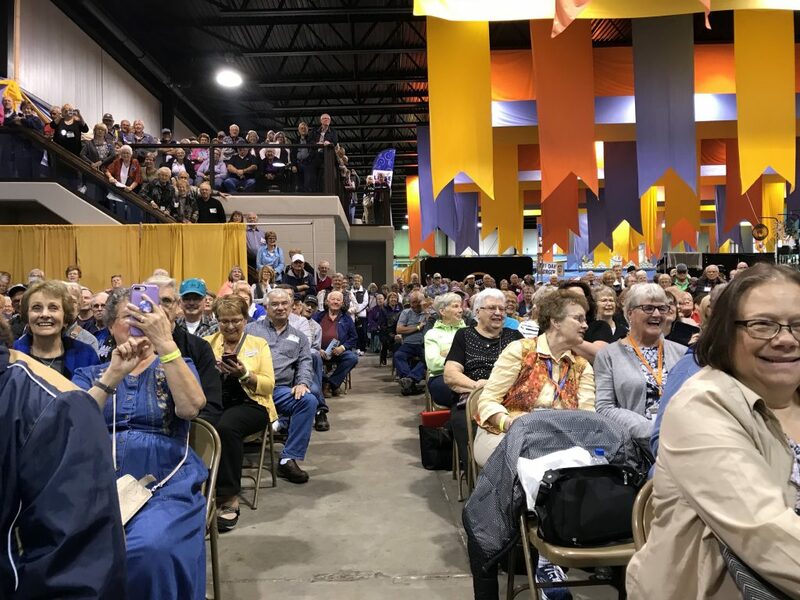 Not only was this the largest crowd to ever watch lefse being made, but also the folks were smiling — smiling Scandinavians!? — as they watched Norsk Hostfest celebrities try to make lefse. I write my 2018 Norsk Hostfest report from Paris, France, where I am vacationing. Writer friend Tim Brady asked if I was hanging out on the Lefse Bank. His wit is unparalleled, but so far I have not found lefse. However, I can hold on until the end of the week when I head to Norway. 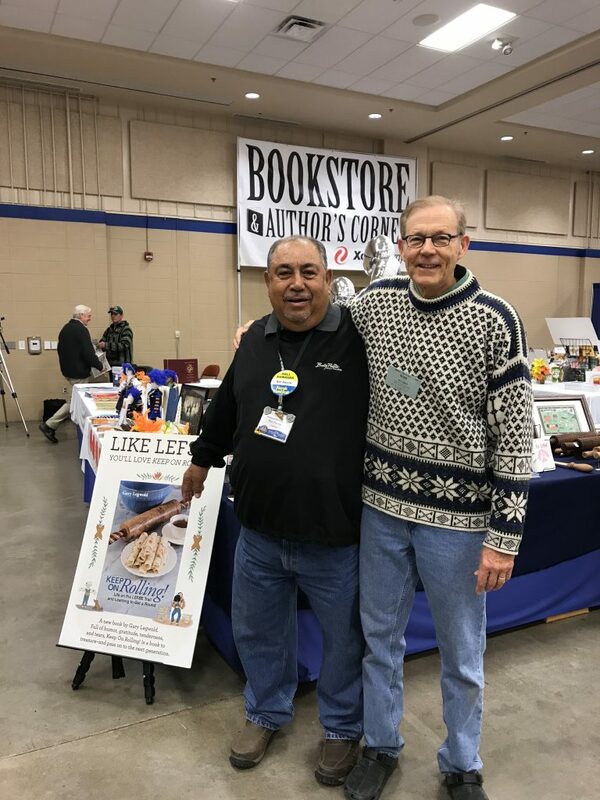 Finding lefse was not a problem last week when I sold books and lefse-lutefisk stuff at the Norsk Hostfest in Minot, North Dakota. Gotta say that of all the attractions — the scads of excellent comedy and musical acts (mostly free) as well as the endless shopping — the most attractive thing to see was the sea of Scandinavians who were actually smiling! I swear — and some were laughing! They’d come to my table looking grumpy, but then they’d brighten when they saw my lefse and lutefisk books. That made me feel good. This smiling stuff got out of hand during the Lefse Masters Celebrity Competition, featuring Daniel O’Donnell, Williams & Ree, and The Texas Tenors. I was to serve as a judge. The competition started at 2:30 p.m. on Wednesday on the stage of Stockholm Hall. I was a bit late getting there, and as I walked into Stockholm Hall, the room was charged and laughter was directed at the stage, which I could not see. I was confused why so many people were spilling from the stage area into the vendor aisles and up the stairs to what is the Lefse Mezzanine, where the Lefse Masters is held throughout the week for the non-celebs. But as I wove my way through the crowd, it became clear folks were there to watch the celebs roll and grill lefse. I was to sit at the judges’ table front and center and observe the skills and techniques of the contestants. 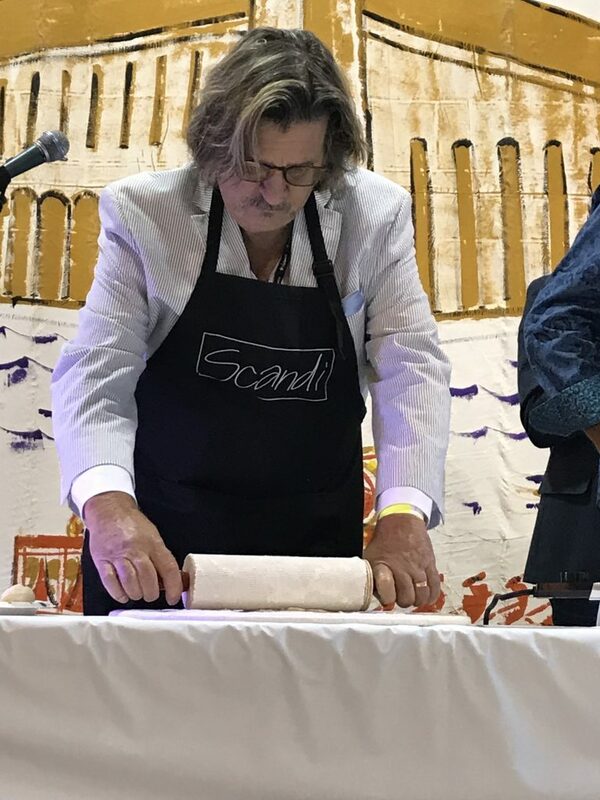 I was among the three lefse judges front and center as the celebrities — Daniel O’Donnell, Williams & Ree, and The Texas Tenors — fumbled and yukked their way through the lefse-making competition. The Texas Tenors on the right were the winners. Judges were from left Miss Norsk Hostfest 2018 Lily Bonebrake, me, and Jane Grunseth, who was too shocked by the antics onstage to turn for the photo. 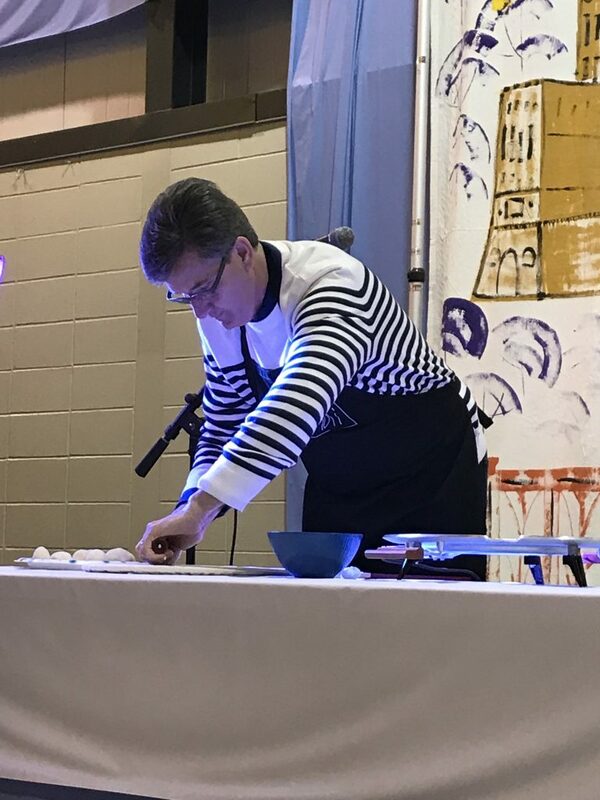 Daniel O’Donnell was very intent on making a winning round of lefse, but he often became distracted by smoke rising from his grill. Once he threw his burned lefse offstage, and then broke out into his beautiful tenor voice singing “When Irish Eyes Are Smiling”. Round? What Is Round, Exactly? Bruce Williams, half of the comedy team of Williams & Ree, rolled lefse in spite of the wacky comments from his partner Terry Ree. For my book Keep On Rolling!, I interviewed Williams about using lefse in his act. The judging was difficult between Daniel O’Donnell and The Texas Tenors, with TTT coming out on top with a pretty nice lefse. Williams & Ree? They submitted a lefse that looked like it had been used to clean a cannon. All good fun, good enough to make the Scandies smile. 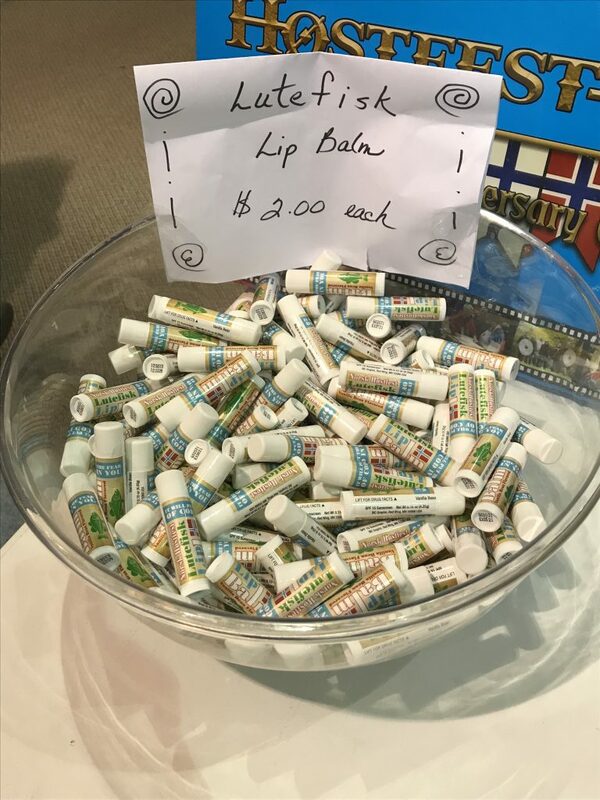 My last day at the Hostfest I was relieved to discover the lutefisk lip balm. Cost was $2 on sale at a store outside the Great Hall, where all the big-name acts appear. I was disappointed that the lutefisk lip balm did not smell or taste like lutefisk. I mean, I like lutefisk and would have considerd it a bold move had the makers of this balm gone for the real deal rather than a vanilla bean flavor. The label said of this lip balm: “It will put the fear of cod in you.” Vanilla bean does instill any fear. We can do better than this! That’s right, lutefisk lip balm. Only at the Norse Hostfest! 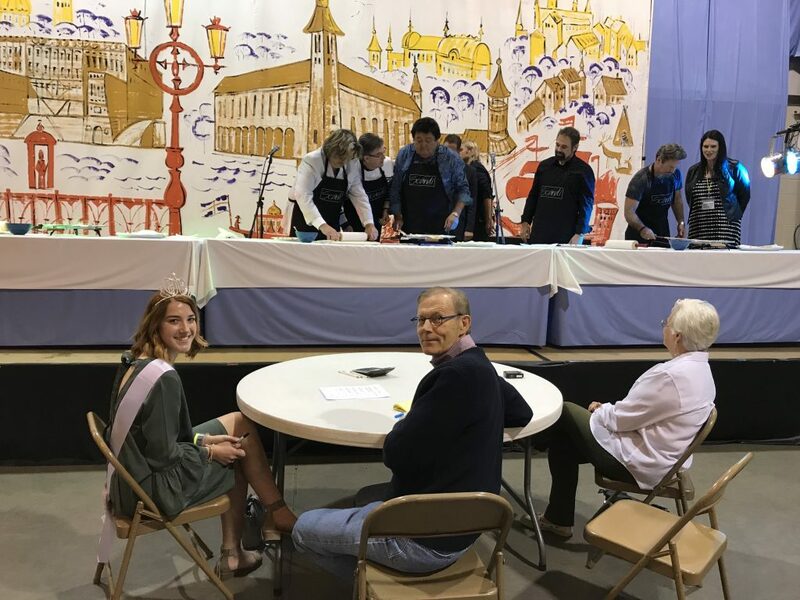 The lefse makers who were judged to have made lefse so good that they placed first, second, or third in Hostfest’s Lefse Masters lefse-making competition earned a cash prize of $200, $100, and $50 plus lefse rolling pins that are adorned by a rose medallion painter. Very cool awards that will undoubtedly be passed down for generations to come. 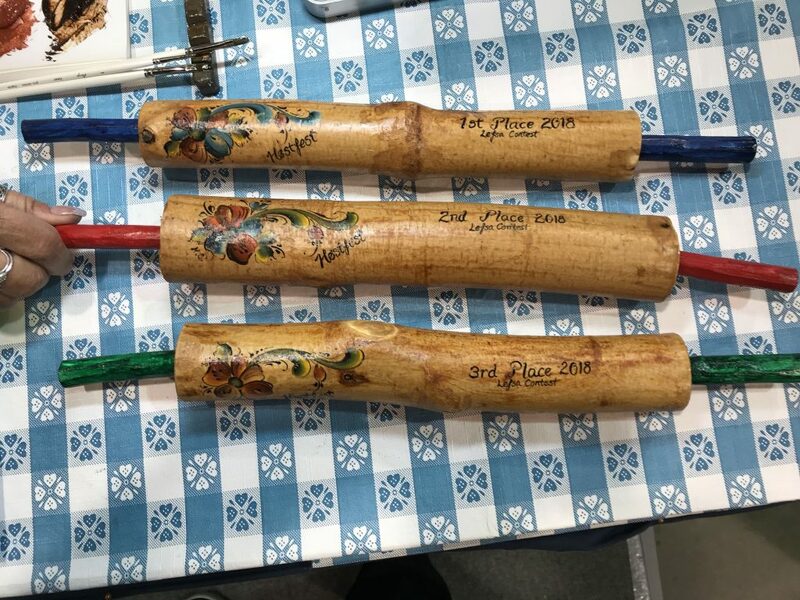 The winners of the Lefse Masters lefse-making competition earned as a prize these hand-painted rolling pins. Ron is a Hostfest original and one of the most endearing men you’ll meet in Minot. Frankly, he is one of the reasons I return year after year. See you in 2019, Ron! Ron Garcia and I before the opening of the last day of the 2018 Norsk Hostfest.